Yogi Berra was arguably the most beloved baseball player you can think of, as the great Mike Vaccaro writes in today's New York Post.. Put it this way -- not only are both Yankee fans and Met fans mourning his passing at the age of 90, but I have seen multiple Red Sox fan friends do their own tributes to the Yankee catcher. Think about it. How many Yankees would Boston fans ever have warm feelings for? Berra was also a pop culture icon. From Yogi Bear to YooHoo ads to even the local Rizzuto-Berra Lanes, a bowling alley in Clifton, NJ, the town where I went to school, Yogi was everywhere. His playing days were done before I was born, yet I and everybody else of my generation knew who he was, thanks to him transcending pop culture. He also was a coach in the late 1970s Yankees teams, which put him in pinstripes for the Reggie/Billy wars -- and for those two titles. Also, the fact that he was a local -- he lived in Upper Montclair, not far from my hometown of Passaic -- made him a big figure in northern New Jersey. Who else would get a museum in that area on his life, after all? Berra lived a life about as good as you can imagine. Ten World Series championships, three MVPs, a loving wife and great kids and grandkids. A hero in World War II. He was in good shape, physically and mentally, until the end, which is no small thing. And for somebody known for goofy sayings, he kept his dignity in one very important way. Unlike other Yankee managers, like Billy Martin, who kept on putting up with George Steinbrenner's abusive ways when George was at his worst, Berra walked away from Yankeeland after The Boss fired him in 1985 just 16 games into the season, without having the courtesy to tell Yogi to his face. Berra stayed away until 1999, when he was opening his museum, and Suzyn Waldman brokered the peace. Then, when The Boss honored him with a special day at The Stadium, David Cone pitched a perfect game on that same day. Amazing. I still don't understand how Berra did not make it into the Baseball Hall of Fame on the first try. His numbers, especially his low strikeout rate, were just remarkable. In recent years, the Broadway show "Bronx Bombers" helped portray his life. I was asked by somebody connected to the producers to give my opinion of the play. I felt that with them not showing his estrangement with Steinbrenner, they were leaving out a very important part of his story. For a man that some depicted as a clown, Berra had so much class in his refusal to put up with Steinbrenner's shenanigans. 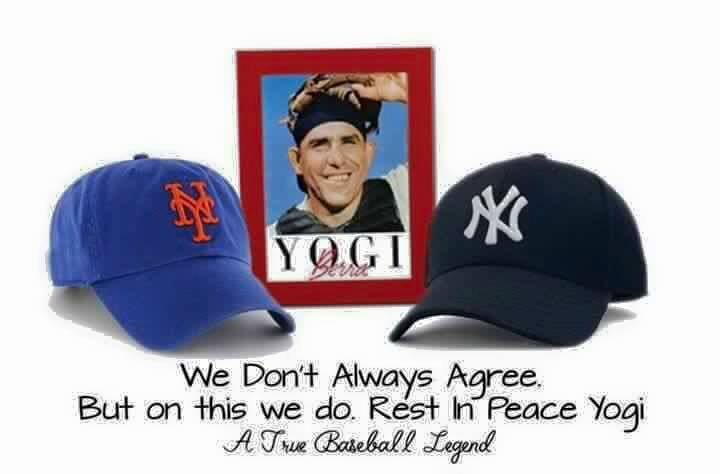 Yogi really was something else. I will leave Squawker Jon to write about Berra's impact on his Mets. But suffice it to say that Berra will be missed by all baseball fans. He'll be reunited now in heaven with his beloved Carmen, though. And with his old Yankee teammates.